McClure-Massimo. Kathleen Marquardt McClure, daughter of Steven and Tammy McClure of Springfield, Ill., to Dennis Justin Massimo, son of Debra and Dennis Massimo of Princeton. Ms. McClure is a 2001 graduate of Springfield High School, a 2005 graduate of Southern Methodist University with a Bachelor of Business Administration degree in Finance, and a 2009 graduate of the Rutgers-Camden School of Law where she received her Juris Doctorate. She currently works as an Associate for Wilson, Elser, Moskowitz, Edelman & Dicker in Manhattan. Mr. Massimo is a 1999 graduate of The Lawrenceville School and a 2004 graduate of Southern Methodist University where he received a double Bachelor of Arts degree in Philosophy and English. He is currently at work on his dream of re-developing the city of Trenton, alongside the development team at Capital Real Estate Group. 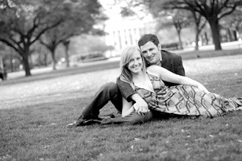 The couple currently resides in Manhattan and will be married in June 2011 at the Governors Mansion in the brides hometown of Springfield, Ill.